Bangalore, Get Farm Fresh Milk Delivered Right At Your Doorstep! 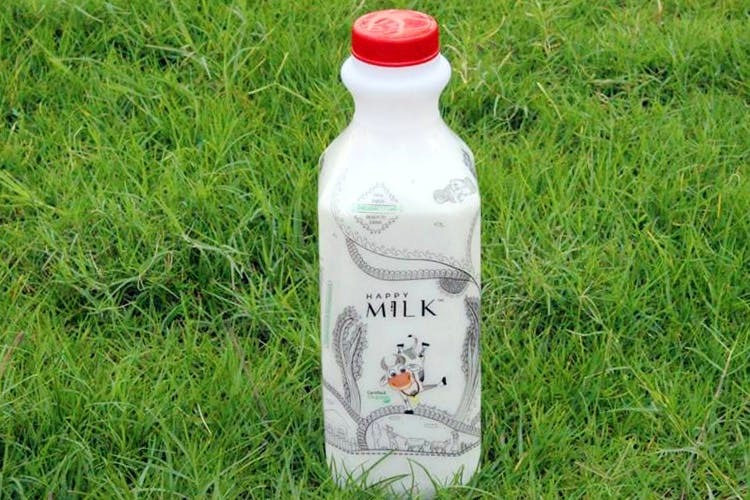 Happy Milk is a Bangalore based brand which specialises in organic certified farm fresh milk and dairy products, and does home deliveries. Ready to drink farm fresh milk is delivered right at your doorstep. Their other products are organic curd and organic ghee. All of which are freshly produced at the company owned Farm and have no added preservatives. Happy Milk currently delivers in all areas in and around Bangalore. You can place an order for their products by WhatsApping them or calling on their number. It is currently priced at INR 80 for a litre of milk. The brand has used a traditional approach when it comes to packaging. The milk and ghee is packaged in a glass bottle, which makes it look quite fancy, whilst the curd is packaged in a matka, to add to the authenticity of being fresh and organic. We recommend you drink it straight out of the bottle (or a glass!) and not add any coffee and certainly not tea. It's rich as it is, and the fresh taste is lost if you mix it. Leave your empty glass bottles outside your door to extend your delivery subscription.